The below artworks are the most important by Eduardo Paolozzi - that both overview the major creative periods, and highlight the greatest achievements by the artist. 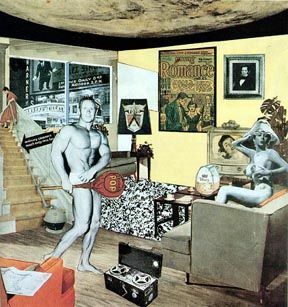 Artwork description & Analysis: This collage was made by Paolozzi as part of a series called "Bunk," composed of images from American magazines, given to Paolozzi by American ex-soldiers in Paris. A bunk can be seen to mean two things: the shell-like bed soldiers in service sleep on or a synonym for "nonsense." Both cases conjure the ideas of soldiers, stationed far from home, perusing periodicals in the privacy of their sleeping quarters at night in order to fantasize, or gaze nostalgically, about a seemingly more normal life back home, lured by the glossy pages of a magazine. The piece includes the cover of a magazine called "Intimate Confessions," which features a voluptuous woman who, it is implied, spills her secrets inside the magazine. The inclusion of the cherry pie posits a tongue in cheek wink to the similar treatment of women and food in what was becoming new visual language in American advertising after World War II. The woman is faced with a hand holding a gun, which has fired the cartoonish word "pop!" An airplane with a propaganda-type message of jolly patriotism flies in the lower left corner alluding to the disconnect between the manipulations of mass media and the realities of day to day life, which at this time for Paolozzi were steeped in a country dealing with the more gloomy aftermaths of a difficult war. Paolozzi was fascinated with American culture as a boy, perhaps as a way to escape a contrasting life at home, which from very early on was steeped in the notions of man being vulnerable to the workings of an overarching government. Looking toward brighter, shinier culture as a pastime was a worthy escape mechanism and this series explored this practice by compiling an image very much like the advertisements being used to sell certain ideal versions of a once removed lifestyle. It was the first of its kind and resonated greatly within the current circle of British artists who were equally looking outward to America with its slick and robust confidence to cull their images and ideas on direct opposition to the stale tradition of art in their own country. This is considered to be the first use of the word "pop" in art of this type, and is credited for launching the Pop art movement when Paolozzi finally shared it with artists from the Independent Group in 1952. His work was original, crude and rudimentary with dog-eared and dirty cuttings on an uncleaned piece of wood. But it would become a key source of inspiration to more polished work by artists such as Richard Hamilton and Andy Warhol working in the fresh, new genre. Artwork description & Analysis: This work by Paolozzi was also made as part of his "Bunk" series, drawing inspiration from Surrealist and Dadaist collage works, such as those of Max Ernst and Hannah Hoch. Paolozzi cut colorful images from advertisements he found in American magazines and assembled them to create a montage of the blossoming American consumer culture. He included cartoon and photographed images of attractive women being used to market products, domestic appliances and cars which became the symbols of a post-War boom, and the branded "Dr. Pepper" soft drink. The compilation of colorful images meant to sell a happy existence that could be available to all was alluring to Paolozzi because rationing was still in place in Britain in 1948, and economic conditions were hard in a country on the verge of bankruptcy. He was looking at American consumerism from an outsider's perspective, implicitly highlighting the differences between the two countries. He was fascinated by the medium, and wrote "where the event of selling tinned pears was transformed into multi-colored dreams, where sensuality and virility combined to form, in our view, an art form more subtle and fulfilling than the orthodox choice of either the Tate Gallery or the Royal Academy." Artwork description & Analysis: This tabletop bronze sculpture is an abstract composition made up of two unexpected shapes hanging from a pole between two supporting pillars. A degree of symmetry creates a visually balanced whole. However, a feeling of discomfort is created by the strange forms, which seem to have been impaled on the rod that suspends them. The imagery, although emphatically abstract, hints at sexual forms in the existence of the short inner rods which seem to reach toward each other for interaction, asking the viewer to question their visual associations in a way that is typical of Surrealist art. The work clearly shows the influence of the Surrealist group Paolozzi became familiar with in Paris at this time, especially Alberto Giacometti. Although Giacometti's artistic style had moved on from Surrealism by the late 1940s, Paolozzi is looking back to the earlier aesthetic of the movement from the 1920s and 1930s and offering his own interpretation of Surrealist ideas. Artwork description & Analysis: The title and eye-like wheel on the figure's head make reference to the Cyclops, a one-eyed giant of Greek mythology. In Homer's Odyssey, the Cyclops Polyphemus is powerful but his single eye is also vulnerable, and he is tricked and blinded by the clever Odysseus. 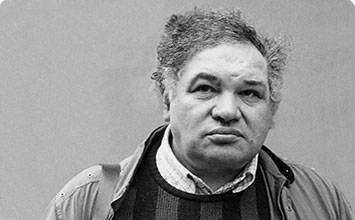 Paolozzi's figure is similarly complex; it is both seeing and unseeing, and it is both imposing and melancholic. Its composition in bronze, pockmarked and riddled with holes, make it appear as if it is rusting or decaying, a common theme seen in his warped depictions of the human head. Cyclops can be read as an allegory for man in the modern age of nuclear weapons; reduced from the giant of the classical world to a dilapidated and incomplete state, made up of machine components and the tools of industry. The semi-abstracted figure was created using the lost-wax technique, a sculptural process favored by members of Surrealist circles including Salvador Dali. To produce the work, Paolozzi pressed metal items into softened clay before pouring in wax and finally casting the figure in bronze. This innovative use of found items took Paolozzi's collecting instincts (first seen in his collages) in a new direction. The artist once claimed of works like this, "I use a collage technique in a plastic medium." Paolozzi made a number of robot-like, human-sized works during the mid-1950s. He was fascinated with robots for much of his life, perhaps as an allegory for man within a system beyond his control. They owe something to the existential beings produced by Giacometti, with the addition of Paolozzi's own vision and interests. The works don't have a feel of a bright future; they are a vision of a "used future" (a term that came to some prominence at the time). And yet, these emotionless collections of parts do seem to have stability and pride in them, a quality that seems closer to an attempt to prolong life, rather than the opposite. Artwork description & Analysis: To produce this work, Paolozzi created a series of collages, which he then combined as if they were slides for a film. He applied a similar collage technique to the cutting and editing of the film fragments, splicing together disparate images from books, magazines and popular culture. The resulting effect is one of constantly shifting images that flash up as if by visual association, often throwing up unlikely pairings, such as James Joyce and the silhouette of a dancer made up of machine parts. In this way, Paolozzi invites the viewer to form a narrative based on the disparate images, playing with ideas of the human subconscious. He called the film an "homage to Surrealism" and claimed it was intended to demonstrate the "schizophrenic quality of life." For most of the images, Paolozzi chose older photographs or images from magazines, creating a sense of nostalgia that runs throughout the film. The work is distinctly witty, both in its semi-philosophical title and in the juxtaposition of its imagery, pointing to an important facet of Paolozzi's work and personality in which the external consistently informs the personal. It also demonstrates his constant commitment to experimentation and new media. Artwork description & Analysis: The Silken World of Michelangelo is part of a series that Paolozzi produced as an unbound book called Moonstrips Empire News. It is made through the screen-printing process, a technique that began to interest Paolozzi during the 1960s. He was intrigued by the mechanics of the process and wanted to explore its associations with the commercial printing of advertisements. It is a medium that was being explored by American Pop artists such as Andy Warhol, and Paolozzi's pop art screen-prints run in a similar vein, working with a consciousness of the Pop art movement that he helped to initiate. However, Paolozzi's work, by this point had moved beyond Pop art's usual remit of advertising and publicity; instead he combined these images with visual references to art history and also to mechanical processes. The inclusion of both a Mickey Mouse figure (on the left) and a negative photograph of Michelangelo's David (to the right) prompts the audience to question issues of artistic reproduction and appropriation. Disney's Mickey Mouse represents popular consumer culture, whilst the David recalls a golden age of original artistic production. The implication is that the Michelangelo work had been reproduced so many times and in so many contexts that it had become devoid of its original meaning and now represented another facet of mass-production and consumerism. Paolozzi asks us to explore the relationship between human beings and the mass-production afforded by technological innovations that had become common by this time. While still rejoicing in the colors and imagery of American consumer culture, Paolozzi also feared for the state of humanity in the nuclear age of technological weapons. His screen-prints created a more lively juxtaposition to his darker sculptural works as he concertedly worked to process his feelings of both the dark and light aspects of progress in the contemporary world. Artwork description & Analysis: One of Paolozzi's largest projects began when he was commissioned to design 1000 square meters of mosaics for the London Underground tube station at Tottenham Court Road. Paolozzi was concerned with how commuters would react to the mosaics. He asked, "what happens when people pass quickly through the station on the train? Will people relate to the metaphors I sought in connection with life above ground - cameras, music shops, saxophones, electronics?" The design starts at the top of the main escalator, drawing the viewer's eye onward as they continue their journey. This work was intended to be seen on the move, and his imagery is similarly dynamic, switching between abstract and figurative forms. 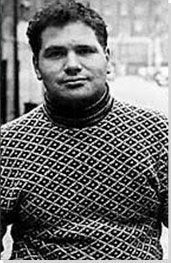 The result was so well received that an exhibition was subsequently organized at the Royal Academy entitled "Eduardo Paolozzi Underground". The president of the RA at the time claimed that Paolozzi's mosaics proved that "art can transform our everyday surroundings and need not be restricted to the narrow confines of art galleries." This was a key concern for an artist who took his inspiration primarily from the visual language of advertising or abandoned machine parts, rather than from the historical works to be found in museums. Sadly, however, part of the mosaic was lost when Transport for London redeveloped Tottenham Court Road station in 2015. Nevertheless, the majority of the work continues to be seen by the general public on a daily basis. First published on 01 Dec 2016. Updated and modified regularly.